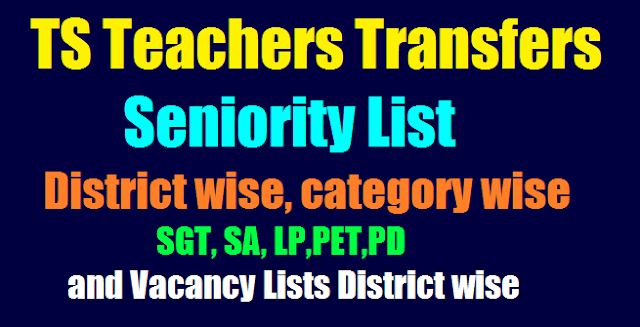 TS Teachers Transfers 2018 Final Seniority List download District wise, category wise SGT, SA, LP,PET,PD and Vacancy Lists District wise. TS Teachers Transfers 2018 Seniority and Vacancy Lists Download. Transfers Vacancy and Seniority List of Adilabad, Khammam Hyderabad , Nalgonda, Karimnagar , Warangal, Medak, Ranga Reddy, Mahaboobnagar , Nizamabad old 10 Districts of Telangana Category wise of GHM SAs LPs SGT PET as per their entitlement points. School Education Department of Telangana, Commissioner and Directorate of School Education has started Teacher Transfers 2018 Process. Teachers invited to submit Online Application Form through Online Link will be available at transfers.cdse.telangana.gov.in Teacher Transfer aspirants and long standing teachers submitted Online Application form up to 11-06-2018 with deatiled information like place of working duration of Working Date of Appointment , Date of Birth information for Prefferential points and other details and submitted . As per their working place category, Duration of Working Date of Appointment, Entitlement Points will be calculated and Entitlemnt points decide their Seniority for Transfers in the District. Now they are awaiting for seniority list. as per schedule the provisional Senoirity list announnced on 15-06-2018 and the final seniority list to be released on 22-06-2018. The district wise seniotity seniority lists available in this page. After Submission of Online Application form printout should be submitted to DDO i.e HM/MEO. DDOs forward the Application forms to DEO. As per the data given by us, Entitilement Points will be awarded and accordingly Seniority list will be generated by automatic Programme. Provisional Seniority List of SGT SA LP PET GHM for Transfers will be displayed Online in DEO Webiste. If Any Objections, submit through proper channel with suitable enclosures. Final Seniority List will be displayed before Transfers Counselling. Detailed Schedule for Transfers will be issued by DEO. As per the Existing and arising Vacancies, Teachers may opt their willing place. If you Select "Save as PDF"
Tags: TS Teachers Transfers 2018 Counselling Schedule SGT School Assistant Language Pandits PETs GHMs Seniority List for Transfers Cadre wise category wise Management wise Clear Vacancy Arising Vacancies List Download Transfers Vacancy and Seniority List of Adilabad, Khammam Hyderabad , Nalgonda, Karimnagar , Warangal, Medak, Ranga Reddy, Mahaboobnagar , Nizamabad old 10 Districts of Telangana Category wise of GHM SAs LPs SGT PET as per their entitlement points download.